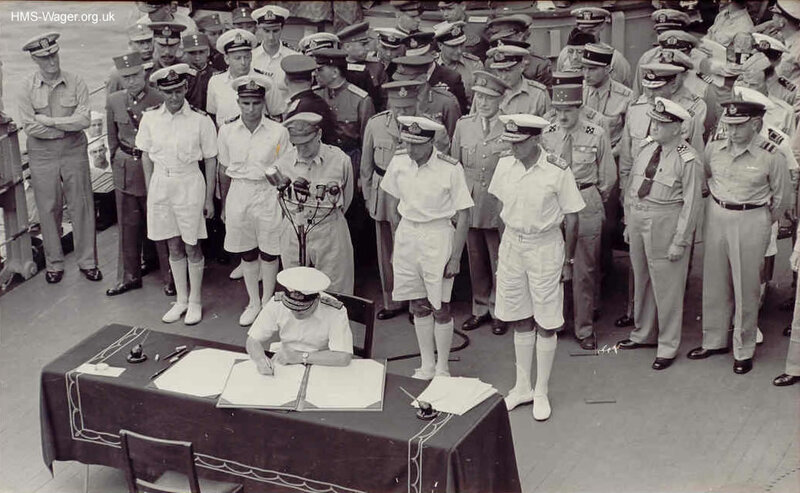 Admiral Sir Bruce Fraser, Commander-in-Chief British Pacific Fleet (BPF), signing the instrument of surrender of the Japanese Empire on behalf of the United Kingdom, on board the battleship USS Missouri, 2 Sep 45. At the microphones behind him is General of the Army Douglas MacArthur, the American who was Supreme Commander Allied Forces Southwest Pacific Area (SWPA). To MacArthur’s right is Temporary Surgeon Lieutenant G R Gayman RCNVR, the Medical Officer of HMS Wager, who was asked to represent the Royal Canadian Navy at the surrender. The senior naval officer to his right is unidentified but those on MacArthur’s left are admirals; one is almost certainly Vice-Admiral Sir Bernard Rawlings, second-in-command to Fraser. Fleet Admiral Chester Nimitz is probably the officer standing to the far left in the photograph. For more information about the signatories and the senior officers present, see http://en.wikipedia.org/wiki/Instrument_of_Surrender_of_Japan.